Okay, the title's a bit of a come-on, since it's not a very good radio; but it's an AM radio, nonetheless, with digital tuning to boot. Moreover, it can be built without any additional active components. If you have a Propeller Demo Board, a resistor, cap, inductor, wire antenna, and a decent ground are all you need. Now that I've got your attention, here's the theory behind it. Most consumer radios on the market are superheterodynes. In such receivers, the incoming RF signal is "mixed" with a sinewave coming from a tunable local oscillator (LO). Mixing is basically analog multiplication, which produces, in addition to the original RF and oscillator signals, signals which are at both the sum and difference frequencies of the two. The output of the mixer is filtered to a single, fixed, "intermediate frequency" (IF) and then amplified. In AM (amplitude modulation) broadcast radios, which tune from 550KHz to 1600KHz, the IF is usually at 455KHz. So, by varying the frequency of the local oscillator from 1005KHz to 2055KHz, one can obtain a 455KHz difference signal from the mixer for the entire broadcast band. The output of the IF amplifier is then introduced to a "detector", which rectifies and low-pass filters the IF signal to produce an audio waveform. A receiver similar to the superheterodyne is the direct conversion receiver. In such a receiver the "intermediate frequency" is zero. In other words, the LO is tuned to the exact frequency you want to listen to, and the difference signal is simply the detected audio, which can then be lowpass filtered and amplified. But there's a catch: the local oscillator must not only have the same frequency as the desired signal, it must also have the same phase. To understand this, suppose the incoming RF carrier and the LO were 90° out of phase with each other. When multiplied together, these two signals would effectively cancel each other out, and you'd hear nothing. When they're in phase, the positive swings would multiply, returning positive results, and the negative swings would multiply, also returning positive results. But getting the LO to lock onto an incoming carrier can be tricky — especially if that carrier is weak. where I is the output of one mixer (from the "In-phase" LO), and Q is the output of the other mixer (from the "Quadrature-phase" LO). Well, that's enough theory to lay the groundwork for the Propeller receiver. I've really glossed over a lot of stuff, but this is a forum post, not a book, and I want to get to the actual hardware and software. The antenna also connects, through a capacitor, to pin A3 of the Propeller. This is the "analog" input terminal. The feedback comes from A4 through a 470K 0805 SMD resistor, which I soldered between pins A3 and A4 right on the chip itself. I've omitted the usual filter caps to Vdd and Vss (Gnd), choosing instead to let the inherent input capacitance of A3 do the filtering. This keeps both the input impedance and frequency response of the ADC high, which is necessary for detecting weak RF signals. During positive swings of an incoming signal, A4 will be sending more 0s than 1s to counterbalance it; during negative swings, more 1s than 0s. One counter can do this, set up in the "positive-with-feedback" special analog mode. Unlike the usual ADC usage, though, we're never going to read this counter again. It's just that string of 1s and 0s fed back from A4 that we're interested in. I love the Propeller's counters! I don't know if Chip knew what all could be done with them when he designed them, or if he just had an inkling that, with the right set of features, almost anything could be accomplished. In any event, the counters make ideal local oscillators and mixers! The oscillator part is pretty easy: just configure two counters as numerically-controlled oscillators (NCOs) in quadrature with each other. The frequency will be the frequency of the station you want to tune in. So, if I want to receive KIXI 880 in Seattle, I set up both counters to output 880KHz square waves, 90° out of phase with each other (i.e. PHSB = PHSA + $4000_0000). Now comes the magic part: the mixers. The counters can be configured to count up whenever two inputs satisfy a Boolean conditional. The Boolean equation can be anything you want: AND, OR, NAND, NOR, XOR, you name it. I used XOR. Each "mixer" counter gets two inputs: the feedback from A4 and one of the LO outputs. If the LO output is low when A4 is feeding back 1s, predominantly (i.e. when the antenna signal is low), the counter will count up at a fast clip. Likewise, if LO is high when A4 is feeding back 0s, predominantly, the counter will, again, count up at a fast clip. In other words, the counter will count up faster when an incoming RF signal is in phase with the LO than when it's not. Moreover, the rate at which it counts up will be proportional to the amplitude of that signal. So, to read the amplitude of a signal in phase with the LO, one need only zero the mixer counter, wait awhile, then read it to see how far up it counted. On average, there will be as many increments during the sample period as non-increments, so the mean (average) count will be half the number of system clocks occurring during the same period. Any signal that's out of phase with LO, or of a different frequency, will contribute as many increments as non-increments, thus having no effect on driving the net count away from the mean. The length of the sample period will affect two things: the audio frequency response and the signal-to-noise ratio. Like most things in life, each of these two desirable qualities increases at the expense of the other, so you have to strike a balance. I got the most pleasing results with a 16KHz sample rate, which yields an 8KHz audio bandwidth. This is about as good as AM radio audio can get anyway, since the stations are spaced 10KHz apart. You can lower the sampling rate to get less static, but the audio starts to sound more "boomy". The counters do virtually all the work. There's not a lot of code required, outside of setting up the counters, reading them, and shuffling data between them via the hub. The attached program is configured as a scanner for the AM broadcast band. It increments continuously by 10KHz steps from 550KHz to 1600Khz, pausing at each frequency for three seconds, which is long enough to tell if something's there. It displays the frequency on a TV monitor, via tv_wtext (included). I've also used it for LF reception below the broadcast band with some minor success. As I stated in the intro, it's not a very good receiver — in fact it sounds pretty crappy and noisy. If, like me, you live in a fringe area, you may be disappointed by its performance. But, even then, it does illustrate the capabilities of those amazing Propeller counters. And that, really, was the main point. Update: Owing to advice received from Beau Schwabe, based on his own testing, I've changed some component values. The inductor is now 500uH; the feedback resistor, 10M; the coupling cap, 0.047uF; and the antenna, a 2-meter-long vertical wire. The attached schematic reflects these changes, which did lead to an improvement in performance. Also, I've corrected a bug in the program's square routine. The bug should have had no effect on the small values involved, but could cause trouble if adapted for other uses. In a later post (17 Aug 08), I show how to wind the required inductor using readily-available parts. There's also a photo of the complete setup, with a detailed look at the feedback resistor. We experimented with the Propeller on the Technical University of Budapest. Unfortunately, the synthesiser of the propeller is very noisy. Now I ordered an AD9951 DDS chip (sample) from Analog Devices. Would it be possible to produce right radio reception with the DDS and a 90 degree phase shifter according to his opinion? Very nice work. I have been very slowly contemplating if and how I can make a ham radio with a Propeller. I haven't done enough to have the noise yet but I hope I think of a way to stop the noise. Also thanks for reminding me about the other chip just in case it is needed. I planned a logo last year to a similar project. I asked in e-mail the Parallax's officers, that I am allowed to use this logo for the project. They were glad that somebody deals with this topic very much. Allowed the usage of the logo! Let you make use of it for this work if he believes it in that manner. Good work Phil. Can't wait to try it. Hi Phil, Very nice work indeed. Note however, I believe this technique of deriving the 90 degree I/Q phase shift after-the-fact can be troublesome when the modulation bandwidth is a significant percentage of the carrier frequency. Your I/Q phase shift is 90 degrees at the carrier frequency, but deviates away from 90 degrees as you move away from the carrier. But if it works, the proof's in the pudding! At first thought I'm not so sure you'll be able to input the I/Q output from your 9951 to the propeller and have it work as a local oscillator in Phil's technique, the pins have to be sampled and I think this may introduce phase noise (jitter). However, there's nothing to prevent you from using the 9951 to mix externally using a Quadrature Synchronous Detector (QSD), or "Tayloe Mixer" as it's often called. 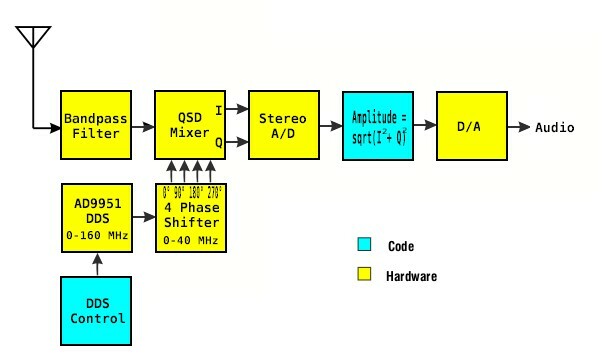 The resultant baseband I/Q would be applied to the propeller via A/D converters, then the propeller can perform the DSP and output demodulated audio data to a D/A, etc. You might want to consider Silicon Labs' [noparse][[/noparse]www.silabs.com] Si570 or Si571 programmable VXO/VCXO instead of the 9951. It is simple to deal with, programs over I2C, has superb phase noise performance and no significant spurious products (unlike the 9951 DDS). However there is no direct I/Q output from the Si570/571, but you can use a simple circuit using two flip-flops to generate I/Q clock output at Fout/4; see the attached drawing. There is a board and a link for a group buy for the Si570/Si571 at the WB6DHW site mentioned above as well. For best performance, I recommend you use the LVDS version of the Si570 and then convert to CMOS with a Fairchild FIN2002 LVDS/CMOS translator. This is not to say the CMOS version of the Si570 is poor, the LVDS version is only slightly better, and most CMOS versions available to buy have +/-50ppm stability over full temperature range while the LVDS version is +/-20ppm. Nice! Assuming one can generate AM frequencies, can't you have Prop-Prop wireless with this? I say thank you for the hint! 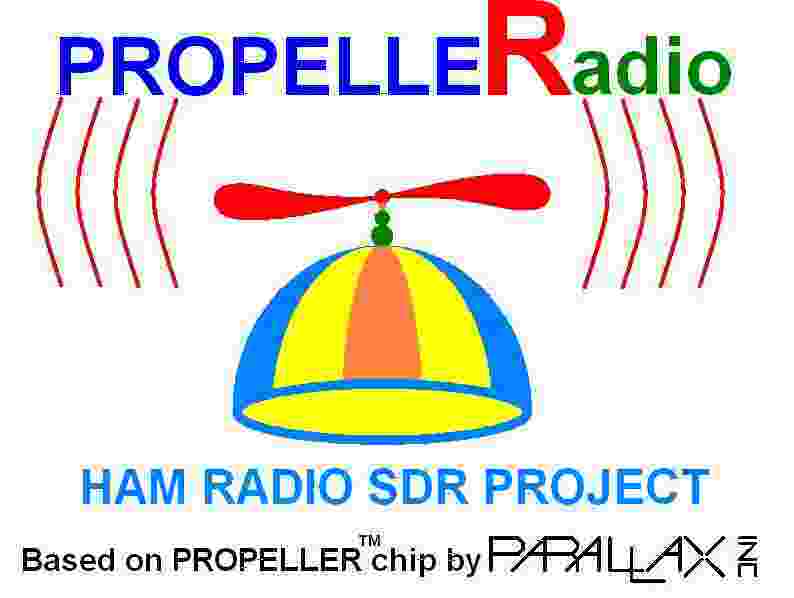 My first idea was a radio receiver (with I/Q demodulator) with the internal synthesiser of the Propeller. The inner synthesiser a lot imply additional noise. Anyway distinguished, but not radio onto an aim it was planned. My second idea: an AD9951 generates the stable sinus oscillator signal. This signal is going onto a phase-shifter, in the output the quarter of the frequency and 90 degre phase shift. A mixer would get here, and the IQ sign onto the A/D converter. The digital output of the mixer (and A/D converter) circuit gets into the Propeller. Effectively the propeller only a I/Q demodulator with FFT. Beside this controls the AD9951 DDS chip. I think, it would be possible to achieve very clear radio reception with this solution in USB/LSB/CW/FM and other modes. Thanks Phil! Who wouldn't want to give this a try? Neat project and a great educational project too. Very cool! I too live in a fringe area, but I have a decent antenna set up, along with a tapped coil/cap rig for tuning. I'll give this a shot later. Fantastic - who cares much about the quality. It is the simplicity of the design (few parts) and the theory to make something work like this. Your article is to be commended - great block diagram, schematic and theory of operation. This is a great educational project! I remember building crystal sets in primary school - some fitted in matchboxes and some in shoe boxes. They were all great fun and learning experiences - this will be too - and keep kids out of trouble to boot! Yes, your diagram is close, I think you get the idea. The QSD is external to the propeller as are the A/D and D/A. You will likely need a low pass filter after the D/A. You have four inputs to the QSD from your four-phase shifter. For a digital QSD, you can use only two 90 degree quadrature square wave inputs at the receive frequency. The dual flip-flop I/Q clock generator circuit in my last post does this from a source that's four times the receive frequency. Study the Fairchild FST3253 data sheet for-example keeping in-mind that you are putting quadrature waveforms into the clock pins as per a schematic like the one attached to this message, make a timing diagram and follow how the switch commutes. The schematic attached is for an actual direct-conversion SDR kit you can buy for around $45 USD (see the softrock URL in my previous post in this thread). The schematic uses the Fairchild FST3253 with the flip-flop clock generator and Si570 for the local oscillator (CMOS version included in kit). I don't want to hijack Phil's thread with a general discussion on SDR hardware. I sent you a Personal Message (PM) on this forum with my email address should you wish to discuss this further. Neat project!! ... and thanks for the comment "He Who Understands Inductors and Knows What to Do with Them"
I knew what needed to be done, but did not get my head around a solution in code... Nice work! Without going into a huge amount of detail... since the 330uH is by itself and not in parallel with an external capacitor to form an LC tank circuit (excluding the inductors self-capacitance) we will look at the impedance based on the frequency. The Length of the Antenna also makes a difference and contributes an LC component to the impedance value above to form an RLC tank. You can get much better results and use a much smaller antenna if you use an RF transformer (two closely coupled coils or a single tapped coil) with a Capacitor to match the resonant frequency to something like 1100kHz (<-- approximate middle of the AM dial) and use that in place of your 330uH coil. The impedance of the antenna should also be matched to the RF transformer. Edit: Actually a 63pF capacitor in parallel with the 330uF inductor would be "tuned" to about 1100kHz but there wouldn't be a good way to couple your antenna to it unless you could wind a few (2-5) turns of wire around the outside of the inductor... one end tied to ground, and the other tied to your antenna.· At first I would try a variable capacitor that is within·63pF +/- 10 pF at least, but you may find a fixed value that works well also.· In this case we would not necessarily want a high 'Q' value for the coil, and or the cap, so a·5 to 10·Ohm resistor in series with the capacitor might also benefit.· What happens with a high 'Q' is that it becomes·a narrow band tuner, and you may loose other stations.· To be able to tune the other channels digitally, we want a little bit of padding here, so a wider band·tuner is more desirable. to provide less loading on the antenna from the feedback I/O pin, allowing weaker signals to be picked up. With 22 gage solid wire, I used a 6-foot piece of it for my antenna. The attached wav file is the result from a radio station a little more than 9 miles from my home. Thank you, Beau! And thanks for the detailed analysis of, and improvements to, the RF circuitry. I'm rather envious of your near proximity to an AM radio station, the closest strong station here being some 40 miles away. Between that and your RF improvements, the S/N of your recording is many decibels above what I was able to obtain! One thing I'd like to come up with is an easy-to-fabricate coil (or transformer) with your recommended values, made solely from hardware store and/or Radio Shack materials. I have a real aversion to winding coils that likely harkens back to childhood fumblings with fine enameled wire and empty toilet paper spools. I'm sure I'm not alone in this, so making this part easier will make the project more approachable for those who are more comfortable with digital design and programming. 'Still some PropSTICK Kit bare PCBs left! Nice one Phil and great quality from Beau's version. I wish my dad was still around, he was a keen radio ham (G0HLH) and would have loved this. About the only electronic components I have with me at the moment are a home made prop board and an LC tank (Ferrite rod, coil, capacitor) ripped out of a dead DCF77 radio controlled clock. So, will it be possible to tune this thing down to 77.5KHz and create a propeller time standard receiver ? Sadly I have no means of building this at my current location. Where's the noise? It sounds too good to be AM. I can't imagine! Let me guess: an MRI scanner for gnats? Magnetic actuator for a 2.4g IR controlled model aircraft. This quite wonderful as it really is a great learning exercise. One can spend a lifetime running 'hello world' routines and blinking lights, but that has never been what Parallax wanted to facillitate. The message here is that with a few simple tools, anyone can do far more than what a text book or tutorial teaches you. The Propeller really allows you to explore outside the box of conventional digital wisdom. And it certainly·is all about exploring new uncharted territories. Thanks. It's sunny and warm here. It is always sunny and warm here.... (unless a typhoon blows through). One thing I'd like to come up with is an easy-to-fabricate coil (or transformer) with your recommended values, made solely from hardware store and/or Radio Shack materials. I have a real aversion to winding coils that likely harkens back to childhood fumblings with fine enameled wire and empty toilet paper spools. Air wound (paper tube) coils still have their place. All materials are at-hand usually. A toilet paper roll or some-such plus scavenge some wire from a dead wall-wart power supply transformer or an audio transformer from a dead dial-up modem. Radio Shack sells assorted magnet wire, Catalog #: 278-1345. Or just use the nice thin wire on a salvaged ferrite antenna and wind it on a paper tube, now you don't need to measure the ferrite relative permeability. You can buy ferrite rods with windings on them at the link below. But there's no technical information. In-fact I found these rods in other places as well but again, no technical information. Perhaps a deep search will turn else something up. I couldn't find a ferrite rod antenna on the Radio Shack site. Not much to add, but a great project! That sounded perfect, Beau! I think this is right up the alley for a young hobbiest. I recall, way back when, my father and I putting together one of those Radio Shack style kits (it was a platic, open topped boat) that had you wind your own motor. Seemed daunting, but I spent a ton of time with it in the bathtub!!! I bet you could make a small little kit for this, and put it in the education section. You have most of what you would need to put in it (document wise) in the posts above. Any more, and you'll lose people. I'm in the "almost lost" group already.. Awesome project! Question: what would it take to adjust to different frequencies? Say aircraft (IIUC, it's close to AM) or even better police frequency. Wouldn't this just be a matter of code? Getting started with a Propeller Protoboard? "One thing I'd like to come up with is an easy-to-fabricate coil (or transformer) with your recommended values, made solely from hardware store and/or Radio Shack materials." See the·"Edit" to my original post. If you are using a different value inductor, then use this ... http://www.deephaven.co.uk/lc.html·... to determine what parallel capacitor to use to approximate 1100kHz. Thanks, Beau. It occurred to me that it wouldn't be so hard to drive a variac varactor with one of the Propeller's DUTY outputs and a suitable LP filter. This would help keep a narrow-band LC filter "in the loop", so to speak, so it wouldn't have to be fiddled with manually. Also, you apparently have an inductance meter at your disposal. I suspect such an item is rare among most Propeller users — myself included. But this is something I'll bet could easily be fabricated using a Propeller and a few passive components. 'Any ideas along these lines? Nice work and a very smart idea. Thank you for sharing with the community. 'Haven't heard anything around 77.5KHz yet. I need a much bigger inductance for that, methinks. "...Also, you apparently have an inductance meter at your disposal. I suspect such an item is rare among most Propeller users — myself included..."
1) Determine the resonate frequency of your known LC values. 2) Substitute the known inductor with the unknown inductor, and measure the frequency. "...But this is something I'll bet could easily be fabricated using a Propeller and a few passive components. 'Any ideas along these lines?..." A true "Bode Plot" would show the ratio between the input and the output in a logarithmic format... What I did·only shows the ratio between Vdd and the output after a voltage divider. Well DCF77 on 77.5KHz is in Frankfurt and only usable up to 2000Km from there. In the USA you have WWVB on 60KHz. Not sure if any of these has any audio modulation that you might actually hear. Just a pulse in the carrier level every second. Even without modulation, if you tune to the side of the carrier by a few hundred hertz, you should still be able to hear it. Even SSB reception should be possible, since the LOs are essentailly reinserting a carrier.